The Fraen Low Profile Lens is specially designed for the Luxeon I, III and V Lambertian LEDs. A software optimized aspheric profile combined with a front shaped surface and a Fresnel profile provide two different narrow and medium beam patterns. 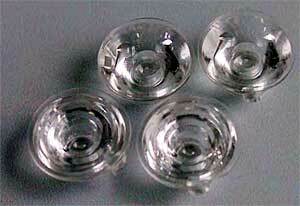 These lenses are not recommended for the Luxeon K2 or Rebel LEDs. For K2 LEDs, check out our line of L2 lenses.